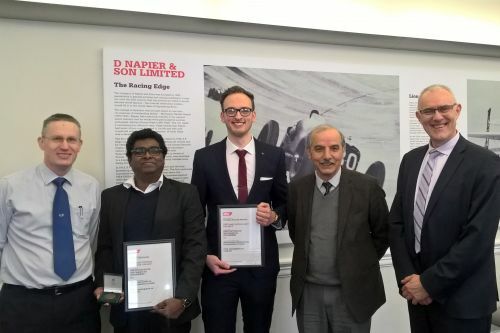 Shane Nicholas and Thomas Pullen-Wright, Final Year students on the M Eng (Mechanical Engineering) programme are the winners of Institute of Mechanical Engineers (IMechE) Awards for their projects. Shane Nicholas and Thomas Pullen-Wright, 4th Year students on the MEng (Mechanical Engineering) degree programme, have won two prestigious Awards from the Institute of Mechanical Engineers (IMechE) for their Final Year projects. Shane is the recipient of the IMechE Project Award for his project, titled, "Further Investigation into the Cooling System of the Formula Student Race Car", while Thomas has bagged the Institution Best Project Award for his project, titled, "Design and Manufacture of an Optical Roots Blower". On 14th February they presented their reports to the board of the Fluid Machinery Group (FMG) at the IMechE's London headquarters. Chair of the FMG, Dr Martyn Yates, from Rolls Royce, presented the Awards to the winning City engineering students. He said that it was very encouraging to see the quality of work being presented and stated that Shane and Thomas, "are a credit to themselves and to City". The work of these students goes a long way to demonstrate that they can perform to the highest standards within industry. The presentations they made were exemplary and I am proud that their outstanding work has been recognised by the IMechE - the UK's independent professional association and learned society representing mechanical engineers and the engineering profession. City academics are available to provide expertise analysis and commentary on a wide variety of news and research topics. Contact the Press Office to find out more. City, University of London is an independent member institution of the University of London. Established by Royal Charter in 1836, the University of London consists of 18 independent member institutions with outstanding global reputations and several prestigious central academic bodies and activities.